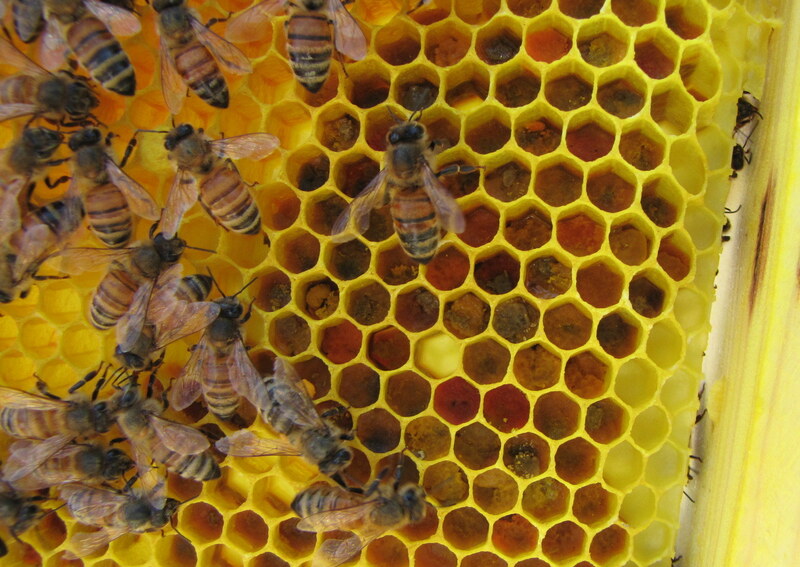 I've been meaning to include the hive inspection results with the associated blog posts, but never got around to it. So that I only have to record them in one place, I'm putting the results up on the blog, instead of here and in an Excel spreadsheet (even though I'm an engineer and it's really hard not to do it!). 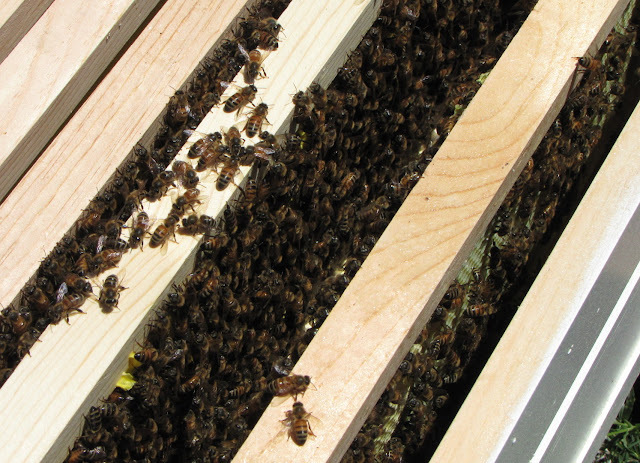 Most of the bees are grouped on these 3 frames, #3,4,&5. Feeders refilled on 18 June 2012, had been empty for several days. We are refilling the 2 quart jar feeders about once a week with 1:1 sugar syrup. We should probably figure out a (cheap) feeder that's larger, to ensure the girls aren't sitting empty for days, and that also allows us to only refill during hive inspections. I've got some ideas. We are feeding syrup for several reasons. 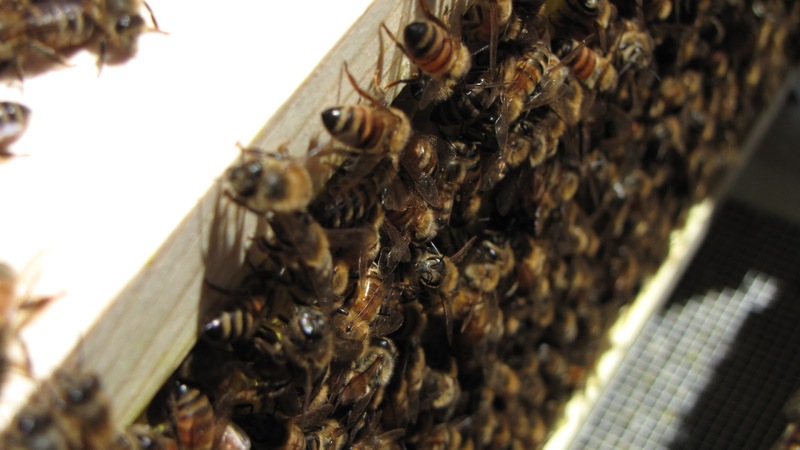 One, it's a new package, and having a solid supply of "nectar" is necessary for them to build comb, especially while the population is building up. Two, it's been really dry so far this year (as evidenced by the forest fires running amuck around Colorado) and I'm not sure how much of a nectar flow is out there. Third, all the bloom times got messed up by the early spring, so we're kind of experiencing our mid-summer dearth now. Obviously some plants are blooming because the bees are foraging and bringing in pollen, but I don't want them to slow down building up if they can't find enough nectar out there. Hence the supplemental feeding. Once they have all the comb built in both of the deeps (the second one hasn't been added yet), we'll pull the feeders off and let them bring in their own supplies. I need to remember to bring the Hive Inspection Sheets with me when we go out to the beeyard; I keep forgetting and Jason has to take notes on plain paper. Not so bad, but the Inspection Sheets have specific items to check and take note about the hive, and a place to record the weather conditions, etc. The engineer in me loves this. It's important to remember to look for drone comb, queen cups/cells, and signs of pests/diseases; things that new beekeepers like Sarah and I might easily forget. One more thing to throw in my beekeeping kit. Lots of bees on the frame, but still a lot of comb to draw. 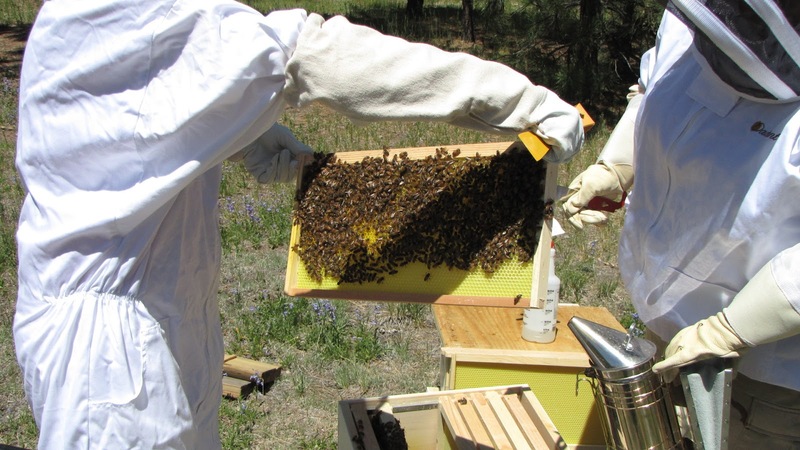 Even though it feels like the bees are making no progress on drawing out the comb, looking back at the records show they are drawing it out slow and steady. Not always straight, but who am I to complain? The beekeeper that's who!